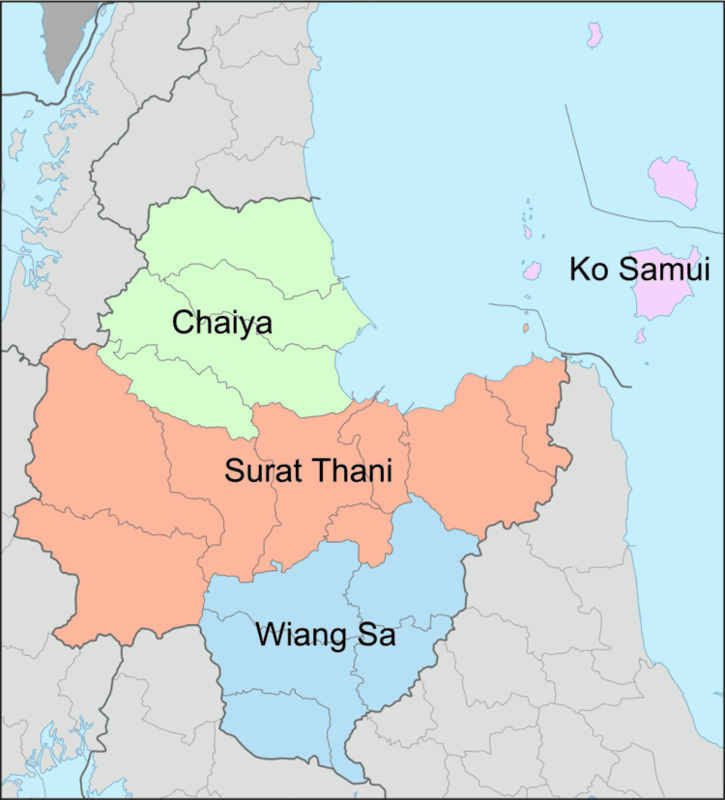 Surat Thani (often shortened to Surat, Thai: สุราษฎร์ธานี) former name Chaiya Province is the largest of the southern provinces (changwat) of Thailand, on the western shore of the Gulf of Thailand. Surat Thani means "city of good people", a title given to the city by King Vajiravudh (Rama VI). The area of Surat Thani was already inhabited in prehistoric times by Semang and Malayan tribes. Founded in the 3rd century, the Srivijaya kingdom dominated the Malay Peninsula until the 13th century. The city of Chaiya contains ruins from the Srivijaya period, and it was probably a regional capital of the kingdom. Some Thai historians even argue that it was the kingdom's capital for a time, but this is disputed. Wiang Sa was another important settlement of the time. After the fall of the Srivijaya, the area was divided into the cities (mueang) of Chaiya, Thatong (now Kanchanadit), and Khirirat Nikhom. Chaiya was administered directly from the Thai capital, while Thatong and Khirirat were controlled by the Nakhon Si Thammarat Kingdom. In 1899, they were all merged into a single province called Chaiya. In 1915, the court of the Monthon Chumphon was transferred to Bandon, which received the new name of Surat Thani on 29 July 1915, during a visit of King Vajiravudh (Rama VI). This was likely influenced by the major port city of Surat in Gujarat, India. The monthon was also renamed Surat. In 1926 it was abolished and incorporated into monthon Nakhon Si Thammarat. The monthon was dissolved in 1933, and the province became the first level administrative subdivision. The provincial administration was located in a building in Tha Kham (Amphoe Phunphin). Shortly before World War II, it was moved to the city of Surat Thani, on the banks of the Tapi River, which is named after the Tapi River in southern Gujarat, India. When the Japanese invaded Thailand on 8 December 1941, the administrative building was destroyed during the battle for the city. It was finally rebuilt in 1954, but on 19 March 1982, a bomb planted by communist rebels blew up the building, killing five people. The third and present building was relocated in the south of the city, and the former site of the provincial hall is now the city pillar shrine (Lak Mueang). The province is divided into 19 districts (amphoe), which are further subdivided into 131 sub-districts (tambon) and 1,028 villages (muban). The province has one city (thesaban nakhon), three towns (thesaban mueang), and 24 sub-district municipalities (thesaban tambon). The most important ones are the following six (complete list). There are also 109 tambon administrative authorities (TAO), responsible for the non-municipal areas. For national elections, the province is divided into two constituencies, each eligible to elect three members of parliament. Neighbouring provinces are (from north, clockwise) Chumphon, Nakhon Si Thammarat, Krabi, Phang Nga, Ranong. Geographically, the centre of the province is the coastal plain of the Tapi River, mostly grassland interspersed with rubber tree and coconut plantations. 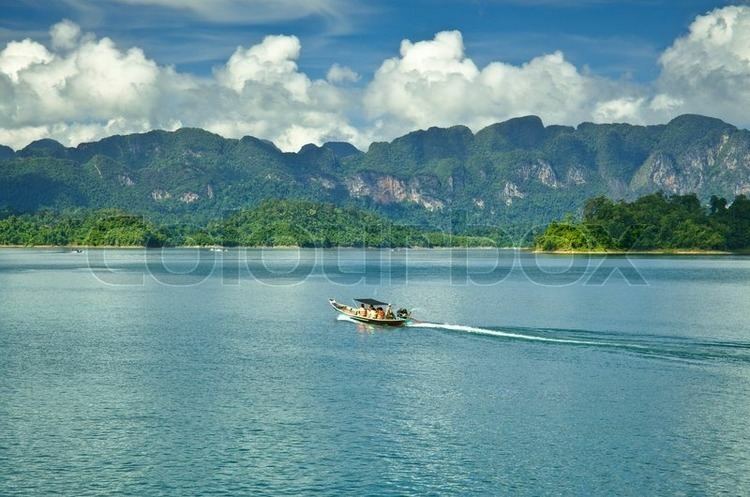 In the west are limestone mountains of the Phuket range which are mostly covered with forest. 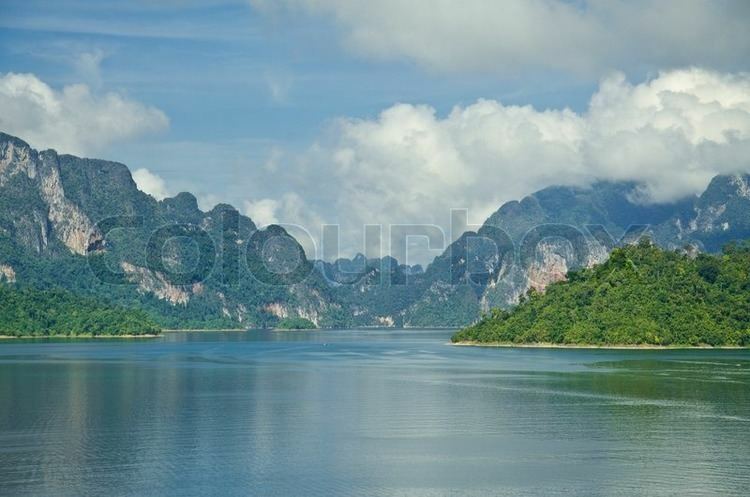 Khao Sok National Park is there. To the east the hills of the Nakhon Si Thammarat (or Bantat) mountain range start to rise, protected in the Tai Rom Yen National Park. 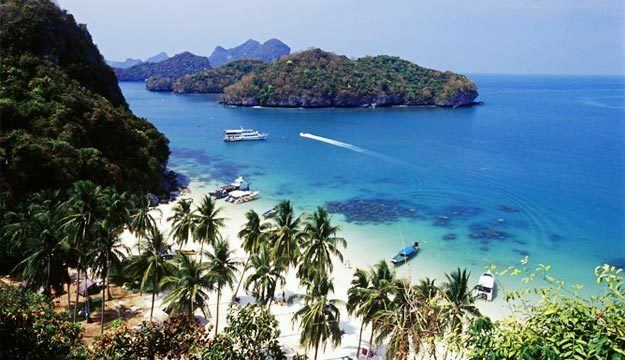 Many islands in the Gulf of Thailand belong to the district, including the tourist islands Ko Samui, Ko Pha Ngan and Ko Tao, as well as the Ko Ang Thong Marine National Park. 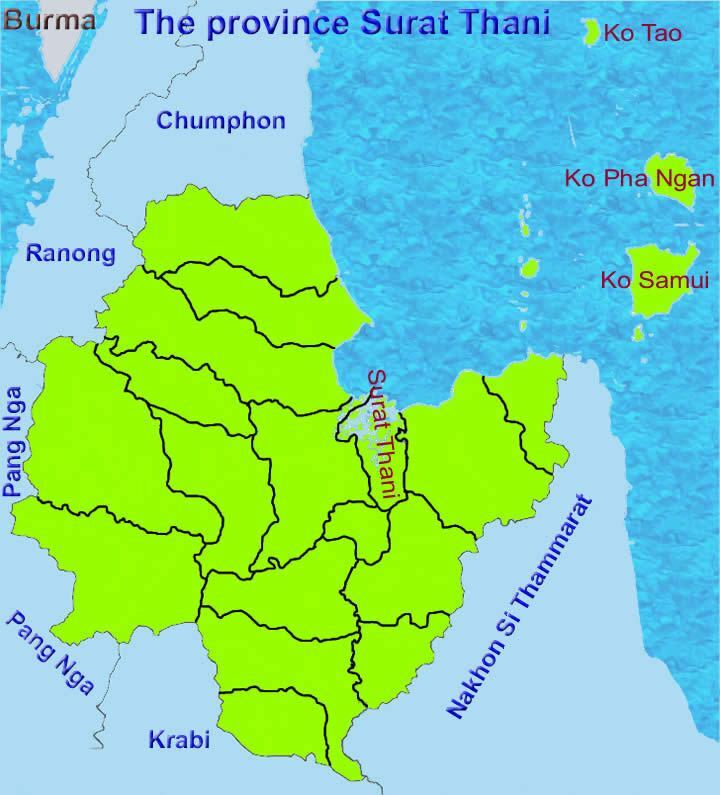 The main rivers of Surat Thani Province are the Tapi River and the Phum Duang River, which join at the town Tha Kham shortly before they flow into Bandon Bay. The delta of these rivers, locally known as Nai Bang (ในบาง), is directly north of the city of Surat Thani. It consists of several channels with small islands mostly covered by mangroves and orchards. Other protected areas in the province are the Khlong Phanom and Kaeng Krung National Park, Than Sadet-Ko Pha Ngan Marine National Park, the non-hunting areas Khao Tha Phet and Nong Thung Thong and the wildlife sanctuaries Khlong Phraya, Khlong Saeng, and Khlong Yan. The Hat Khanom - Mu Ko Thale Tai, which has a few small islands south of Ko Samui, is currently being created. In the 2008 census, the province had a GPP of 132,637.3 million baht (US$4,019.31 million) and GPP per capita of 134,427 (US$4,073.54) compared with a GPP of 122,398 million baht (US$3,599.94 million) and GPP per capita of 125,651 baht (US$3,695.62) in the 2007 census, with a GPP growth rate of 8.37 percent and per capita growth rate of 6.98 percent. The main agricultural products of the province are coconut and rambutan. The coconuts are often picked from the tree by specially trained monkeys, mostly pig-tailed macaques (Macaca nemestrina). The monkey school of the late Somporn Saekhow is the most famous training centre. Rambutan trees were first planted in Surat Thani in 1926 by the Chinese Malay Mr. K. Vong in Ban Na San. An annual rambutan fair is held in early-August and includes a parade of highly decorated floats on the Tapi River. Rubber tree plantations are also common in the province. A notable local product is the hand-woven silk cloth from the coastal village Phum Riang in Chaiya District. Chaiya is also the most famous source of red eggs, a local specialty. Ducks are fed with crabs and fish and the eggs are then preserved by placing them in a soil-salt mixture. The province is crossed by the southern railway, with Surat Thani Railway Station in Phunphin, about 15 km from downtown. A branch line to the west ends at Kirirat Nikhom Railway Station. It was originally planned to run to the coast next to the island of Phuket, but construction ended in 1956. In total there are 32 railway stations in Surat Thani Province. Parallel to the railway in north-south direction runs the Asian Highway 2 (Thailand Route 41). The major road in east-west direction is Rte 401 connecting Takua Pa with Nakhon Si Thammarat, and Rte 44 in southwesterly direction from Kanchanadit to Krabi. Rte 44 was built as part of the land bridge project connecting the Gulf of Thailand with the Andaman Sea. Unlike other highways there are no crossing intersections. The wide space between the two lanes is reserved for pipeline and railway. As of 2014, two international airports are located in the province: Surat Thani International Airport in Phunphin and Samui Airport on Ko Samui. The Surat Thani Airport is served by five airlines: Thai Airways International (operated by Thai Smile from Suvarnabhumi Airport), Nok Air, Thai Lion Air from Don Mueang International Airport, Thai AirAsia from Don Muang and Chiang Mai, AirAsia from Kuala Lumpur International Airport. The Samui Airport is served by Bangkok Airways and Thai Airways International from Suvarnabhumi Airport, Hong Kong, Singapore, Kuala Lumpur, Phuket, Chiang Mai, and Penang. 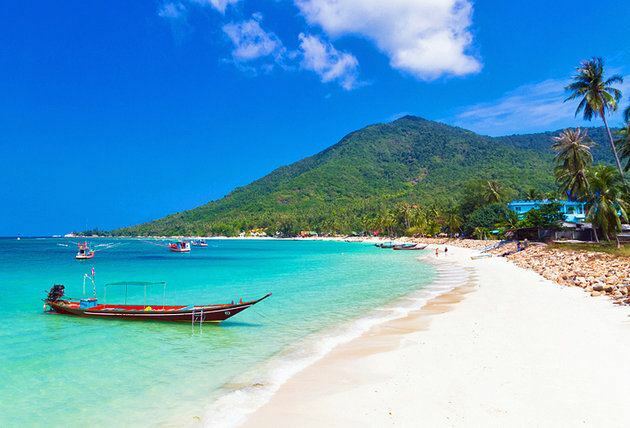 The islands Ko Samui und Ko Pha Ngan are connected with the mainland by ferries, which mostly embark from Don Sak, while the ferries to Ko Tao start at Surat Thani or Ko Samui. The two most important Buddhist monasteries of the province are in Chaiya District. Wat Phra Boromathat Chaiya boasts a chedi in Srivijaya-style, dating from the 7th century and carefully restored. Buddhist relics are enshrined in the chedi, and the surrounding chapels contain Buddha figures in Srivijayan style. The Chaiya National Museum adjoins the temple. Nearby is Wat Suan Mokkhaphalaram, a forest monastery founded by the famous monk Buddhadasa Bhikkhu. Chak Phra Festival – Celebrates the return of Buddha from heaven to earth and to be greeted by multitudes. Celebration takes place every year immediately after the end of 3 month rain retreat, about October. It is celebrated in many parts of southern Thailand, but especially in Surat Thani. The evening prior to Chak Phra Day, billboards are erected showing Buddha's story around the city and celebrations continue day and night. On land, the splendidly adorned floats are pulled across the town by the participants. At the same time, on water a float decorated with colourful Thai designs carries the Buddha image. Chak Phra festivities conclude with a boat race and traditional games. Rambutan and Thai Fruit Festival – Rambutan trees were first planted in Surat Thani at Ban Na San in 1926 by Mr. K. Vong, a Chinese Malay. The annual Rambutan Festival is held during the August harvest. Boon Sad Dean Sib Festival (Southern Traditional) – Held on the full moon of the 10th month in traditional calendar (about August). People go to the temple in remembrance of ancestors. Surat Thani Songkran Festival – Thai New Year water festival is celebrated every year on 13 April. Surat Thani Loy Krathong Festival on the Tapi River – Held on the full moon of the 12th month in the traditional Thai lunar calendar. In the Western calendar this usually falls in November. During the evening of the full moon, people launch symbolic floating "krathong" on the river. Bull Fighting (กีฬาชนวัว) – This ancient popular sport on Ko Samui was once held in fields or on farms. Now, permanent stadiums in various districts take turns hosting the monthly bull fights. The seal of the province shows the pagoda of Phra Boromathat Chaiya, which is believed to have been built 1,200 years ago. The flag of the province also shows the pagoda in middle, placed on a vertically split flag with red color on top and yellow on the bottom. The provincial flower is the bua phut (Rafflesia kerrii), a parasitic plant with one of the biggest flowers of all plants. The provincial tree is the ton kiam (Cotylelobium melanoxylon). The provincial slogan is เมืองร้อยเกาะ เงาะอร่อย หอยใหญ่ ไข่แดง แหล่งธรรมะ ชักพระประเพณี, which translates to "city of 100 islands, delicious rambutan, big shells and red eggs, center of Buddhism". "Red eggs" are a local culinary specialty of pickled duck eggs, while the "big shells" refers to historically abundant shellfish available. "Center of Buddhism" refers to the Chaiya pagoda and Chak Phra Festivals. Talad Sanjao (ตลาดศาลเจ้า) is the night market with a concentration of food vendors on a side street next to Wat Sai. Night Bandon pier(ท่าเรือกลางคืน) Thai fruit and food vendors. Surat Thani City Pillar Shrine (ศาสหลีกเมือง) (Srivijaya-style) The centre of the city. Sri Surat Stupa (พระธาตุศรีสุราษฎร์) – Khao Tha Phet (เขาท่าเพชร) (Tha Phet Hill) is a hill near Surat Thani. The hill has an elevation of about 210 m (689 ft) and offers a good view over the town. On top of the hill is the Sri Surat stupa (also known by its common name, Phra That Khao Tha Phet), which was built in Srivijavan-style in 1957. The stupa contains a Buddha relic donated by India. Next to the stupa is a sweet shorea tree (Shorea roxburghii) planted by King Bhumibol Adulyadej. Ko Lamphu (เกาะลำพู) – A small, car-free island on the Tapi River. It is connected by bridge to the city at the city pillar shrine. Ko Lamphu is a popular place for picnic as well as for sports. A nice view is the riverfront, built as a promenade. Ko Samui – The most popular island in the Gulf of Thailand. Ko Pha Ngan – Home of the Full Moon Party. Oyster Farm (ฟาร์มหอยนางรม) – Surat Thani locals take pride in their farm-grown oysters. They have become a part of the provincial motto. Most oysters are raised around the mouth of Kradae and Than Thong canals. Ban Khlong Sai Monkey Training Centre (ศูนย์ฝึกลิงบ้านคลองทราย) – The center trains monkeys to harvest coconuts. Wat Suan Mokkhaphalaram (วัดสวนโมกขพลาราม) – Suan Mokkh's founder, the late Buddhadasa Bhikkhu, was highly respected both locally and internationally. His "back to basics" form of Buddhism, mirroring that led by the Buddha's earliest disciples more than 2,500 years ago, attracted many Buddhist monks and lay devotees from many countries. Phra Borommathat Chaiya (พระบรมธาตุไชยา) – Constructed along Mahayana Buddhist's beliefs of the 7th century, the great chedi is reputedly the best preserved Srivijaya artwork in Thailand. The stone chedi has 3 receding tiers, each of which are decorated with small stupas. The Buddha's relics are enshrined inside the chedi. Wat Wiang, Wat Kaeo, and Wat Long (วัดเวียง วัดแก้ว และวัดหลง) – These 3 temples are supposedly contemporaries of Wat Phra Borommathat Chaiya. The seated Buddha statue protected by naga, made in 1183, and a sand stone, Chaiya-styled, Buddha statue were found at Wat Wiang. Wat Kaeo and Wat Long have Chaiya-styled brick chedi on indented square bases. Phumriang Village (หมู่บ้านพุมเรียง) – This Muslim fishing village is known for its hand-woven silk cloth in red, yellow, and black. Buddhist Thais in the village weave hats from leaves. Namtok Vibhavadis (น้ำตกวิภาวดี) – This petite waterfall enjoys bucolic surroundings and attracts locals on weekends. Wat Khao Suwan Pradit(วัดเขาสุวรรณประดิษฐ์) – This temple was founded by Luang Pho Choi, one of southern Thailand's most revered Buddhist ecclesiastics. The hilltop 45-metre pagoda contains Buddha relics and commands striking coastal views of Ban Don District. Rock Fish Museum (พิพิธภัณฑ์ปลาหิน) – This museum was established in 1992 by Mr. Kitti Sin-udom, an old fisherman who spent more than 10 years carving stone here. More than 1,000 lifelike sculptures of marine fish found in the Gulf of Thailand are on display. Ratchaprapha (Rajjaprabha) Dam - The completion of this dam in 1988 gave birth to Cheow Lan Lake about 168 square kilometres in area, which is adorned with hundreds of islands and islets. Tang Nam – Streams chiseled across two ridges create this striking gorge. Many people came to pay respect to this place, around which the venerable Buddhadasa Bhikkhu's ashes were traditionally showered. Namtok Than Sawan – This scenic waterfall is three kilometres from Tang Nam. Namtok Sip Et Chan – This 11-tier waterfall originates from Bang Len canal. The first level is largest and most picturesque. San Yang Roi Trail – This two kilometre trail begins at the park headquarters and runs along the mountain shoulder past streams, waterfalls, and moist evergreen forest. A trail to a rarely seen plant called Bua Phut at Bang Luk Chang Mountain. Kaeng Krung National Park (อุทยานแห่งชาติแก่งกรุง) – Mountainous area covered by fertile moist evergreen forests, where some rare and endangered species such as tree ferns can be found. Attractions in the park include hot springs, Bang Hoi Waterfall and Khlong Pa Waterfall. Namtok Tat Fa – A perennial 13-level waterfall is the highest in Surat Thani. The fourth level is most attractive with its 80 m cliff. Tham Khamin or Tham Men – Exotic stalagmites and stalactites in this cave. The walkway is well-lit and fitted with stairs. San Yen – The eastern range, about 40 kilometres long and 1,000-1,300 metres high, is fertile with rare flora, fauna, and wildlife. Namtok Mueang Thuat – This seven-level waterfall has a large basin.